Plant a tree in memory of J.W. Be the first to share your favorite memory, photo or story of J.W.. This memorial page is dedicated for family, friends and future generations to celebrate the life of their loved one. 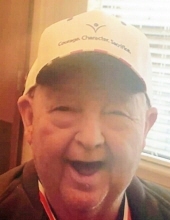 Graveside funeral services will be held 2:00 p.m. Friday, April 5, 2019, at the Floral Hills East Cemetery, Lee’s Summit. Reverend Jerry Tharp will officiate. Full military honors will be conducted by the United States Air Force and the Pleasant Hill V.F.W. Post #3118 Honor guard. Casket bearers are Clint Beasley, Kevin Bennett, Allen Davis, Randy Davis, Russell Klotz, and Tony Klotz. Honorary casket bearers are Jim Berryman, Voyn Breshears, Mike Hatfield, Dave Shaffer, Bill Taylor, and Jimmy Winburn. To plant a tree in memory of J.W. Klotz, please visit our Tribute Store. "Email Address" would like to share the life celebration of J.W. Klotz. Click on the "link" to go to share a favorite memory or leave a condolence message for the family.